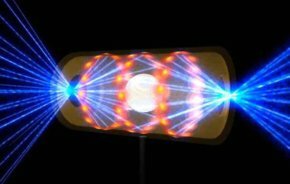 The National Ignition Facility ideas are as close as any out there that I had when I began to consider fusion energy generation again after years of having my attention elsewhere. Working increasingly with lasers awakened thoughts of how this might be used to generate nuclear fusion. Aiming powerful laser beams at a nuclear target to cause intense heating and pressure it should be possible to create conditions to induce fusion. Enough power, the right wavelengths, the right fuel and orientation and just maybe this could happen. 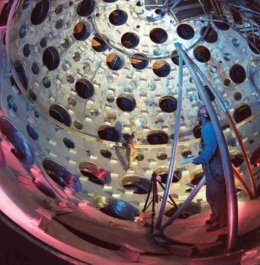 The National Ignition Facility, situated within the huge complex that is Lawrence Livermore National Laboratories (LLNL) in California, is a joint research project with a number of other agencies. 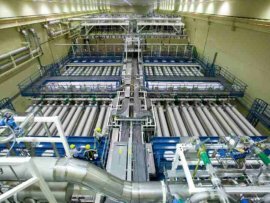 Others involved are General Atomics of San Diego (GA), the Laboratory for Laser Energetics at the University of Rochester (LLE), Los Alamos National Laboratory (LANL), and Sandia National Laboratories (SNL). Along with LLNL, Los Alamos and Sandia over the years have been involved in the USA nuclear weapons development programs. With strategic arms limitation, reduction and the banning of nuclear testing these agencies are more concerned with monitoring remaining warheads and utilising other ways to test materials in thermonuclear environments. This way funding, knowledge and experienced scientific staff are retained and grown in spite of the necessary changes. 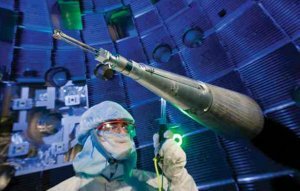 Lawrence Livermore National Laboratories acknowledge the weapons program as key to their fusion energy development. They also note that thermonuclear bombs have demonstrated fusion works. Hence the design of the National Ignition Facility follows the ideas developed in these warheads - rapidly compressing and heating hydrogen isotopes (deuterium and tritium) to cause nuclear fusion. 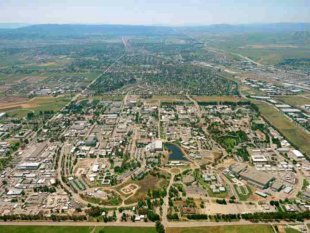 In fact a lot of the experimentation behind the initiative is determined by Livermore Laboratories' involvement in the nuclear program and its responsibility to monitor stored nuclear warheads. This includes the ability to determine the effects on materials of thermonuclear environments. At the core of the National Ignition Facility design is a small gold tube - the hohlraum (German for hollow space) 9mm long by 5mm diameter. Designing the best materials to construct the hohlraum has allowed Lawrenceville Livermore Laboratories to test more materials also involved in the weapons program - including a uranium and gold version. The hohlraum sits as a microscopic target in a huge chamber with 192 portals through which an array of laser beams can be aimed at the interior of the holhraum. By synchronising the 192 beams to arise at the same instant huge energies can be employed. The hohlraum itself not only holds the target fuel but interacts with the incident laser energy beams to produce X-rays from the hohlraum's surface to thereby indirectly cause compression of the fuel. Within the hohlraum sits the actual target - a capsule which holds the fuel, a deuterium and tritium mix. This allows for the lowest temperature requirement fusion reaction. The capsule has been designed to be made of carbon, beryllium or carbon-hydrogen polymers. To stablise the target fuel, the capsule is cooled to 18 to 20 degrees Kelvin (stable to one thousandth of a kelvin). This is to form the deuterium/tritium as an ice inside the wall of the 2mm capsule sited within the hohlraum. The tritium, being radioactive, undergoes beta decay producing some heat which causes the deuterium and tritium coating inside the capsule to be smooth, creating a more even, predictable target for ignition. But it also causes helium to be produced and build up and threaten the integrity of the target. This requires it be used within 36 hours of manufacture. With a power production unit designed to utlise 10-20 shots a second, around a million targets would be required a day at around 25c a target. 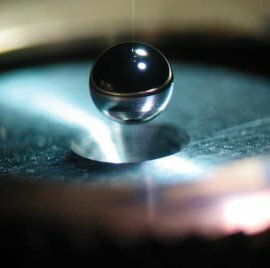 The aim is to rapidly inject fuel pellets into the ignition chamber producing pulses of fusion. The heat from this heats a blanket material (of lithium-bearing liquid metals or molten salts) around the chamber which can then heat water or similar materials to drive turbines. This is the indirect laser array method as the laser energy is being reflected off the hohlraum walls and creates a very even incident energy with the X-rays. 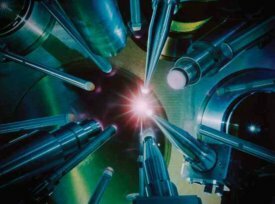 The National Ignition Facility demonstrated in 2009 that the appropriate laser array at a scale for fusion ignition can be built. The next step is being able to demonstate fusion ignition - planned to be achieved by the end of 2012. In 2014 enough energy was produced for a pulse that it exceeded the amount of laser energy to ignite it. However it still took much more power than was generated to drive the lasers. The LIFE - Laser Inertial Fusion Engine - model designed for this utilises these ideas. 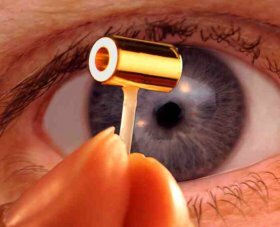 A number of lasers have been developed to drive these devices. The Laboratory for Laser Energetics at the University of Rochester (LLE) has been the main researcher for the lasers. Ideally infrared laser beams cause the initial compression, with subsequent ultraviolet ones to cause the final ignition. The Omega laser with picosecond length pulses can produce an effective power 10 to 20th power W/cm2. At present the heating caused in the optics requires a prolonged pause before the next shot. Also developed is the Mercury laser which is a solid state diode laser cooled by helium to achieve rapid repeated pulses without the shutdown time for optical cooling. The NIF is also experimenting with a direct array - aiming the beams directly at the target. The same energy will produce a slightly greater output and the capsule can be composed of a plastic instead of beryllium and similar materials. Integrating all these technologies into a working power station is planned for the mid 2020s. Then rolling out multiple LIFE plants into the electric grid is planned for the late 2020s and beyond. Effectively this would mean less than twenty years to achieve this. Calculations based on the availability of tritium suggest about a quarter of the USA new build of energy plants could be met by 2050 - just under 40 years from now. The NIF is coordinating with HiPER in Europe in other ideas such as the hot spot where a gold cone is aimed at the centre of the implosion allowing a second ultraviolet laser to fire at this central point unimpeded allowing for a higher energy generation. The actual physics for this is still being worked out. The complexity of the National Ignition Facility project begs the question as to how practical the outcome will be. It may prove that the involved scientists can meet such precise requirements. But can this be reproduced for every facility? And how minor would be a change that could cause such a generating facility to be incapacitated?